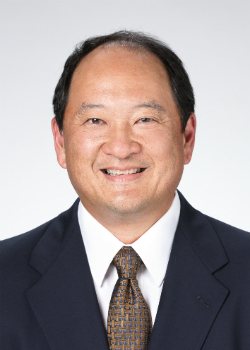 Daryl H. Kurozawa, MD, FACS, is a general surgeon and serves as executive vice president of Products, and Sales & Marketing, for The Permanente Federation. He is also associate medical director of Sales & Marketing, Service Delivery Planning, and Community Benefit with the Hawaii Permanente Medical Group (HPMG) – the state’s largest multi-specialty group practice. As an executive vice president on The Permanente Federation’s National Permanente Leadership Team, Dr. Kurozawa has oversight over the Federation’s products, and sales and marketing function along with oversight of Permanente Advantage. He earned his medical degree from Georgetown University School of Medicine in Washington, D.C., and completed his residency in General Surgery at Oregon Health and Science University Hospital in Portland, Ore. Dr. Kurozawa returned to his hometown of Kona on the Big Island of Hawaii in 1994 to set up a successful private practice in general surgery, and in 2003, he joined HPMG. A member of the Pacific Coast Surgical Association and the American Society of Breast Surgeons, Dr. Kurozawa is also the co-director of the West Hawaii Cancer Symposium. He is a past president of the Board of Directors of the American Cancer Society Hawaii Pacific and is a regional board member of the American Cancer Society High Plains. Active in his hometown, Dr. Kurozawa is also a member of the Onizuka Memorial Committee and is vice chairman of the Board of Directors of the Hawaii Community Federal Credit Union.